Lorraine McNab and Peter Sopow are gunned down outside Lorraine’s home near Pincher Creek, Alberta. Their bodies are found 36 hours later. Lorraine's family speaks for the first time about what happened that day. The police arrive at Lorraine’s property, looking for Peter after he fails to show up for work. A howling wind hampers their investigation. 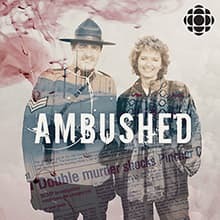 We talk to former RCMP officers who worked the case. Episode 3 - Who wanted them dead? This was no random murder. Police say Peter and Lorraine knew their killer. But who was the target - a lifetime RCMP officer or a kindergarten teacher with a bad relationship in her past? Download Episode 3 - Who wanted them dead? In the months before she was murdered, Lorraine McNab was getting a lot unwanted phone calls, but were they anything more than a persistent suitor? And why was a red sports car parked at the end of a country road the night before the murders? An elementary school teacher emerges as the main suspect. Pincher Creek residents debate if he is capable of committing murder. The double homicide marks the beginning of a dark time for the town of Pincher Creek. After a local man dies in police custody, questions are raised about whether the RCMP itself played a role in Peter and Lorraine’s murder.